Investing in Antique Jewelry from the Edwardian Jewelry genealogy has an unquenchable appetite. This brief, rose-water period, was the forerunner to what I call "the white period" in which shivering colorless crystals & stones were on the hymeneal altar with white hard metals. If you were captivated by the fashion and jewelry worn by Passengers on the Titanic then this area of Antique Jewelry Investing could be worth considering. The famous actress, Kate Winslet (who starred as Rose in the Titanic movie) was wearing Edwardian fashion and jewelry. White and ice marked the period. The tragic titanic sinking, at the crack of doom, in 1912 occurred during the height of the Edwardian period. At times it appears as if the Edwardian jewels have been thrown into the background in the History of Antique Jewelry; like a middle-child in the relatively short Edwardian period, it receded into the shade between two magnificent decorative periods, the Art Nouveau and Art Deco. 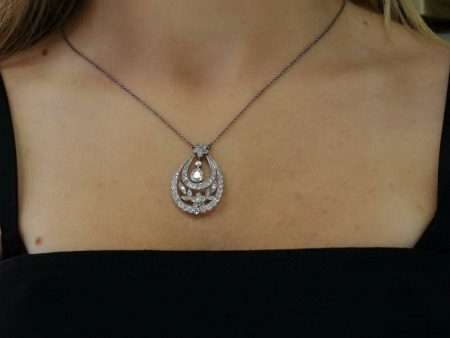 If you're thinking about Investing in Antique Jewelry, then you'll be pleased to know that Edwardian style jewelry, holds some of the finest and most beautiful Antique Diamond Jewelry. The elegance, beauty and superb craftsmanship in the Edwardian belle epoche remains unparalleled. The elegance of design, means that Edwardian pieces, are very wearable today and compliment fashion and beauty in a way that shames mass produced jewelry. Some pieces, may carry characteristics of two distinctive styles from the same period. Abstract motifs and geometrical forms are quite typical for the Art Deco period while the fineness of line and lacey aspect of the piece are typical for the Edwardian period. "much of the work was in the 'Garland Style'... Guirlandes (French for garland) extremely delicate flowers and leaves. Fine millegrain, tiny bead work, and pierced and engraved metals gave the jewelry the appearance of open, airy, and romantic lace and embroidery. Platinum started being used widely either over 18K gold or on its own, so the look was primarily monochromatic with rose, mine, and European cut diamonds, often accented by natural pearls. Platinum enhanced the radiance of the diamonds." Colored gemstones, in particular Green gemstones, such as Peridot and Beryl were added to Lavalier and Negligee pendants. Other looks of the day included wide chokers on grown grain ribbon, bow motifs, pendant earrings, floral pins with a swag of diamonds and wide openwork bracelets. Queen Alexandra and Edward VII's pursuit of luxury set the mood of the period in the second decade of the 20th century in art history. Alexandra (who was known as Alix), was the Princess Diana of her day. She was beautiful, tall, slim and elegant and able to wear clothes and jewelry with grace and style. Nowhere is Edwardian style jewelry better represented than in the jewelry Alexandra wore. The British royal family, encouraged the use of sporting motifs and Edward VII's good luck stone, the Peridot gemstone, resulted in some remarkable Peridot jewelry during the Edwardian period. By the time Art Nouveau jewelry had began to wane, true Edwardian Jewelry was in full swing in Britain as Art Deco was underway on the Continent.